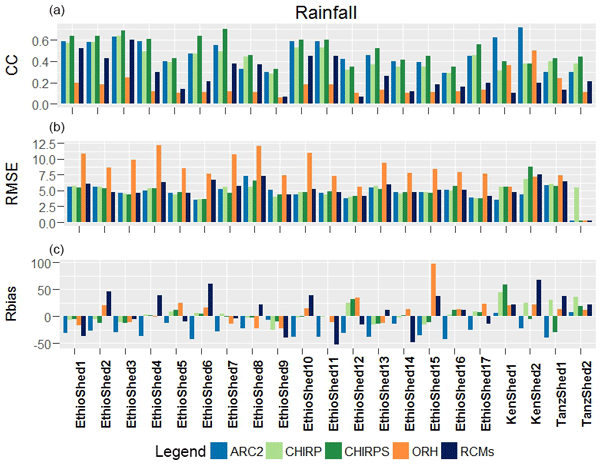 A new global scale rainfall dataset, 12-year long (2007-2018), has been obtained by applying the SM2RAIN algorithm to ASCAT soil moisture data: SM2RAIN-ASCAT. The dataset has a spatial/temporal sampling of 12.5 km/1 day. 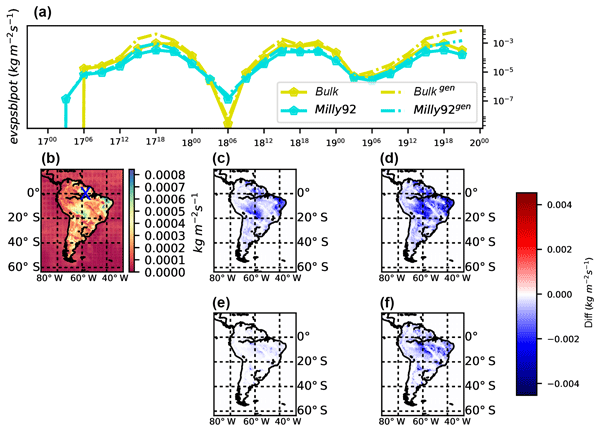 Results show that the new dataset performs particularly good in Africa and South America, i.e., in the continents in which ground observations are scarce and the need of satellite rainfall data is high. SM2RAIN-ASCAT is available at: http://doi.org/10.5281/zenodo.2591215. This study investigates the propagation of precipitation uncertainty, and its interaction with hydrologic modeling, in global water resource reanalysis. 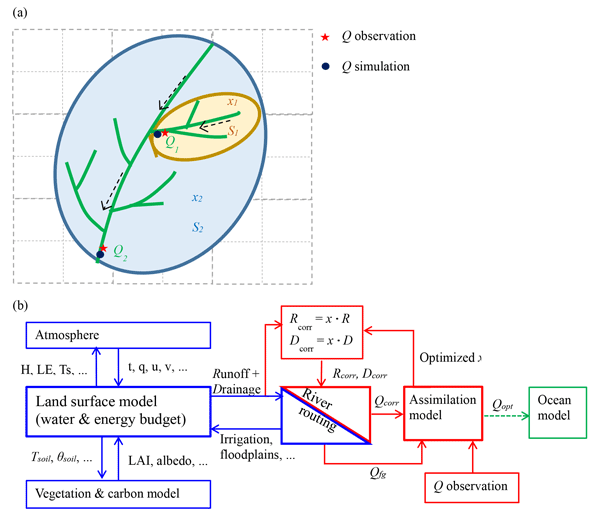 Analysis is based on ensemble hydrologic simulations for a period of 11 years based on six global hydrologic models and five precipitation datasets. 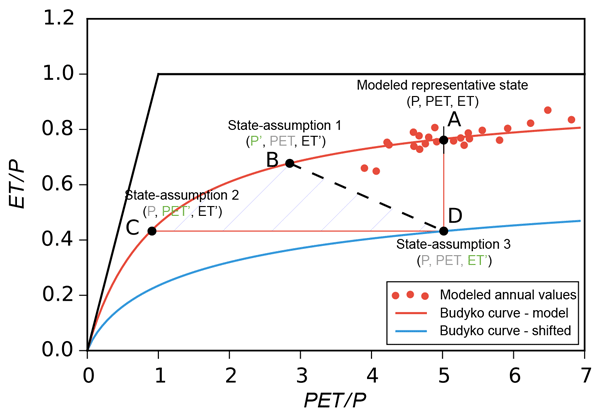 Results show that uncertainties in the model simulations are attributed to both uncertainty in precipitation forcing and the model structure. Vegetation optical depth (VOD) is measured by satellites and is related to the density of vegetation and its water content. VOD has a wide range of uses, including drought, wildfire danger, biomass and carbon stock monitoring. For the past 30 years there exist various VOD datasets derived from space-borne microwave sensors, but biases between them prohibit a combined use. We removed these biases and merged the data to create the global long-term VOD Climate Archive (VODCA). Regional climate experiments coordinated throughout CORDEX aim to study and provide high-quality climate data over a given region. The data are used in climate change mitigation and adaptation policy studies and by stakeholders. CORDEX requires a list of variables, most of which are not provided by atmospheric models. Aiming to help the community and to maximize the use of CORDEX exercises, we create a new module for WRF models to directly produce them by adding generic and additional ones. 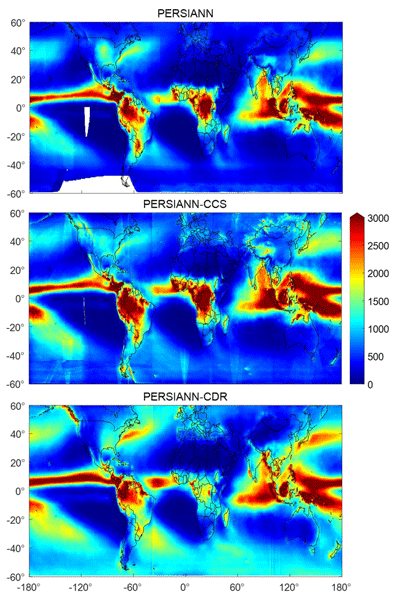 Land surface parameters (such as temperature) can be extracted from passive microwave satellite observations, with less cloud contamination than in the infrared. A cloud contamination index is proposed to detect cloud contamination for multiple frequency ranges (from 10 to 190 GHz), to be applicable to the successive generations of MW instruments. Even with a reduced number of low-frequency channels over land, the index reaches an accuracy of ≥ 70 % in detecting contaminated observations. Soil moisture is a key variable in our Earth system. Knowledge of soil moisture and its dynamics across scales is vital for many applications such as the prediction of agricultural yields or irrigation demands, flood and drought monitoring, weather forecasting, and climate modelling. To date, the ESA CCI SM products are the only consistent long-term multi-satellite soil moisture data sets available. This paper reviews the evolution of these products and their underlying merging methodology. About 70 % of global freshwater is consumed by irrigation. Yet, policy-relevant estimates of irrigation water use (IWU) are virtually lacking at regional to global scales. To bridge this gap, we develop a method for quantifying IWU from a combination of state-of-the-art remotely sensed and modeled soil moisture products and apply it over the United States for the period 2013–2016. Overall, our estimates agree well with reference data on irrigated area and irrigation water withdrawals. This article proposes a new uncertainty estimation technique for multiple datasets. The new uncertainty estimation method considers all the variations in time and space dimensions, so that it avoids the averaging variation in either of the dimension which is necessary in classic uncertainty estimations. Comparisons with classic and new uncertainty metrics demonstrate that classic metrics may underestimate the uncertainties among datasets. Weather, humans, and vegetation control the occurrence of fires. 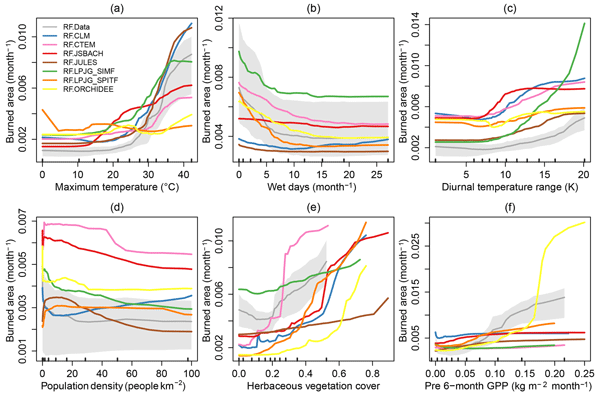 In this study we find that global fire–vegetation models underestimate the strong increase of burned area with higher previous-season plant productivity in comparison to satellite-derived relationships. We explore the vertical transfers of heat, salt and mass between the inflowing and outflowing layers at the Strait of Gibraltar by using a 3-D model with very high spatial resolution that allows for a realistic representation of the exchange. Results show a significant transformation of the water mass properties along their path through the strait, mainly induced by the recirculation of water between layers, while mixing seems to have little influence on the heat and salt exchanged. This study presents a revised river routing scheme for the Organising Carbon and Hydrology in Dynamic Ecosystems (ORCHIDEE) land surface model. The revision is carried out to benefit from the high-resolution topography provided by the Hydrological data and maps based on SHuttle Elevation Derivatives at multiple Scales (HydroSHEDS). We demonstrate that the finer description of the catchments allows for an improvement of the simulated river discharge of ORCHIDEE in an area with complex topography. Model bias is commonly seen in discharge simulation by hydrological or land surface models. This study tested an approach with the Budyko hypothesis to retrospect the estimated discharge bias to different bias sources including the atmospheric variables and model structure. Results indicate that the bias is most likely caused by the forcing variables, and the forcing bias should firstly be assessed and reduced in order to perform pertinent analysis of the regional water cycle. Simulations in China were performed in ORCHIDEE driven by different forcing datasets: GSWP3, PGF, CRU-NCEP, and WFDEI. Simulated soil moisture was compared to several datasets to evaluate the ability of ORCHIDEE in reproducing soil moisture dynamics. Results showed that ORCHIDEE soil moisture coincided well with other datasets in wet areas and in non-irrigated areas. It suggested that the ORCHIDEE-MICT was suitable for further hydrological studies in China. This work improves river discharge estimation by taking advantages of observation and model simulations. The new estimation takes into account both gauged and un-gauged rivers, and it compensates model systematic errors and missing processes (e.g., human water usage). This improved estimation is important not only for water resources management and ecosystem health over continent but also for ocean dynamics and salinity. 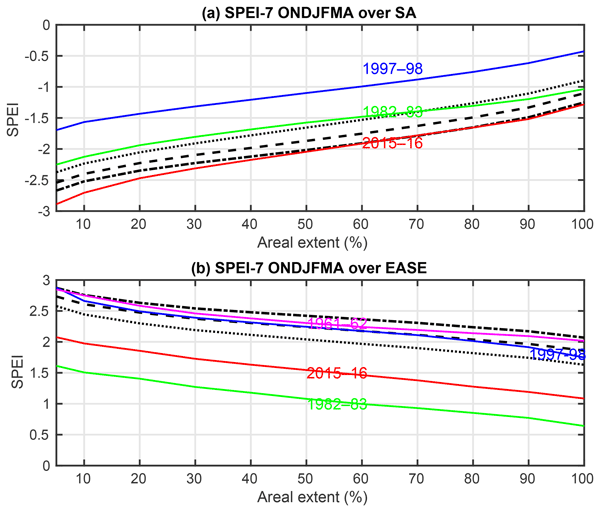 ERA-5 and ERA-Interim driven ISBA land surface model simulations: which one performs better? ECMWF recently released the first 7-year segment of its latest atmospheric reanalysis: ERA-5 (2010–2016). ERA-5 has important changes relative to ERA-Interim including higher spatial and temporal resolutions as well as a more recent model and data assimilation system. ERA-5 is foreseen to replace ERA-Interim reanalysis. One of the main goals of this study is to assess whether ERA-5 can enhance the simulation performances with respect to ERA-Interim when it is used to force a land surface model. We compared land surface model simulations forced by several meteorological datasets with observations over the Euro-Mediterranean area, for the 1979–2012 period. Precipitation was the most uncertain forcing variable. The impacts of forcing uncertainty were larger on the mean and standard deviation rather than the timing, shape and inter-annual variability of simulated discharge. Simulated leaf area index and surface soil moisture were relatively insensitive to these uncertainties. In this study, rainfall is estimated starting from satellite soil moisture observation on a global scale, using the ESA CCI soil moisture datasets. The new obtained rainfall product has proven to correctly identify rainfall events, showing performance sometimes higher than those obtained by using classical rainfall estimation approaches. This study represents the most comprehensive global-scale precipitation dataset evaluation to date. We evaluated 13 uncorrected precipitation datasets using precipitation observations from 76 086 gauges, and 9 gauge-corrected ones using hydrological modeling for 9053 catchments. Our results highlight large differences in estimation accuracy, and hence, the importance of precipitation dataset selection in both research and operational applications. Wildfires affect infrastructures, vegetation, and the atmosphere. However, it is unclear how fires should be accurately represented in global vegetation models. 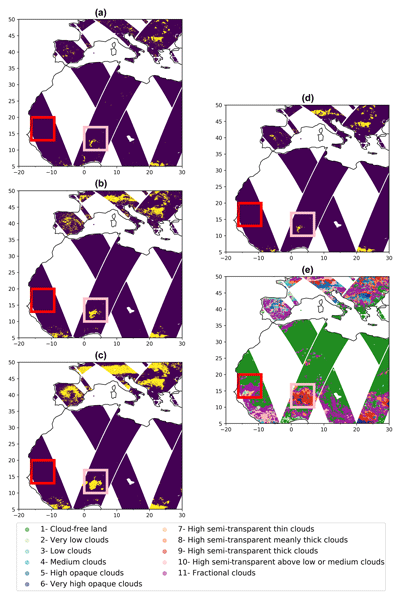 We introduce here a new flexible data-driven fire modelling approach that allows us to explore sensitivities of burned areas to satellite and climate datasets. Our results suggest combining observations with data-driven and process-oriented fire models to better understand the role of fires in the Earth system. LDAS-Monde, a global land data assimilation system, is applied over Europe and the Mediterranean basin to increase monitoring accuracy for land surface variables. It is able to ingest information from satellite-derived surface soil moisture (SSM) and leaf area index (LAI) observations to constrain the ISBA land surface model coupled with the CTRIP continental hydrological system. Assimilation of SSM and LAI leads to a better representation of evapotranspiration and gross primary production. ORCHILEAK is a new branch of the terrestrial ecosystem model ORCHIDEE that represents dissolved organic carbon (DOC) production from canopy and soils, DOC and CO2 leaching from soils to streams, DOC decomposition, and CO2 evasion to the atmosphere during its lateral transport in rivers, as well as exchange with the soil carbon and litter stocks on floodplains and in swamps. 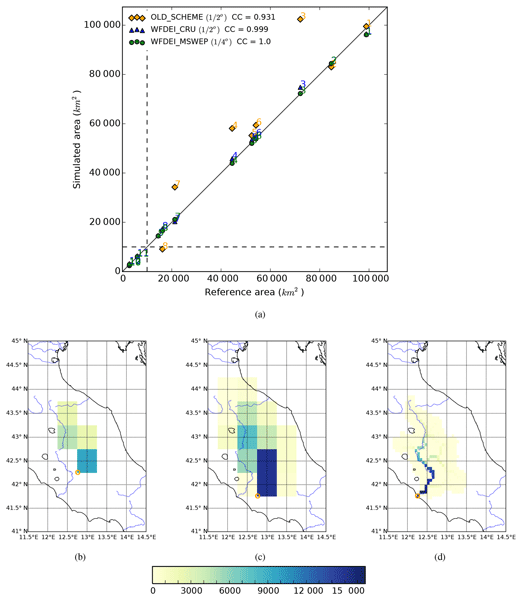 We parameterized and validated ORCHILEAK for the Amazon basin. Soil maximum available water content (MaxAWC) is a key parameter in land surface models. Being difficult to measure, this parameter is usually unavailable. 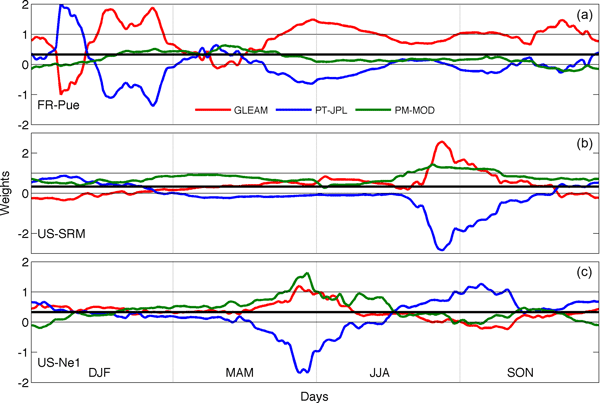 A 15-year time series of satellite-derived observations of leaf area index (LAI) is used to retrieve MaxAWC for rainfed straw cereals over France. Disaggregated LAI is sequentially assimilated into the ISBA LSM. MaxAWC is estimated minimising LAI analyses increments. Annual maximum LAI observations correlate with the MaxAWC estimates. This paper briefly reviews data assimilation techniques in carbon cycle data assimilation and the requirements of data assimilation systems on observations. 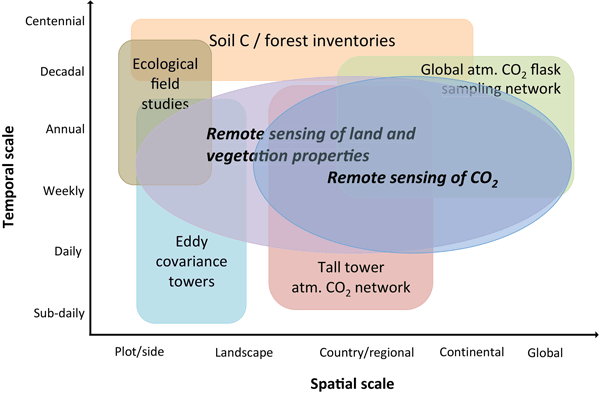 We provide a non-exhaustive overview of current observations and their uncertainties for use in terrestrial carbon cycle data assimilation, focussing on relevant space-based observations. Profile soil moisture is key state variable in the Critical Zone ecology and hydrology. This paper sucessfully used a simple statistical method, the cumulative distribution frequency (CDF) matching method for the first time, to predict profile soil moisture (0–100 cm) from surface measurement (5 cm). The findings here can provide insights into profile soil moisture estimation from remote sensing moisture products. The dataset combines the results of 10 global models that describe the global continental water cycle. The data can be used as input for water resources studies, flood frequency studies etc. at different scales from continental to medium-scale catchments. We compared the results with earth observation data and conclude that most uncertainties are found in snow-dominated regions and tropical rainforest and monsoon regions. This study documents a state-of-the-art estimation of the water budget (rainfall, evapotranspiration, discharge, and soil and groundwater storage) components for the Upper Blue Nile river. The budget uses various JGrass-NewAGE components, satellite data and all ground measurements available. The analysis shows that precipitation of the basin is 1360 ± 230 mm per year. Evapotranspiration accounts for 56 %, runoff is 33 %, and storage varies from minus 10 % to plus 17 % of the annual water budget. Terrestrial evaporation is a key component of the hydrological cycle and reliable data sets of this variable are of major importance. The Global Land Evaporation Amsterdam Model (GLEAM, www.GLEAM.eu) is a set of algorithms which estimates evaporation based on satellite observations. The third version of GLEAM, presented in this study, includes an improved parameterization of different model components. As a result, the accuracy of the GLEAM data sets has been improved upon previous versions. Global satellite observations provide a means to unravel the influence of climate on vegetation. Common statistical methods used to study the relationships between climate and vegetation are often too simplistic to capture the complexity of these relationships. Here, we present a novel causality framework that includes data fusion from various databases, time series decomposition, and machine learning techniques. 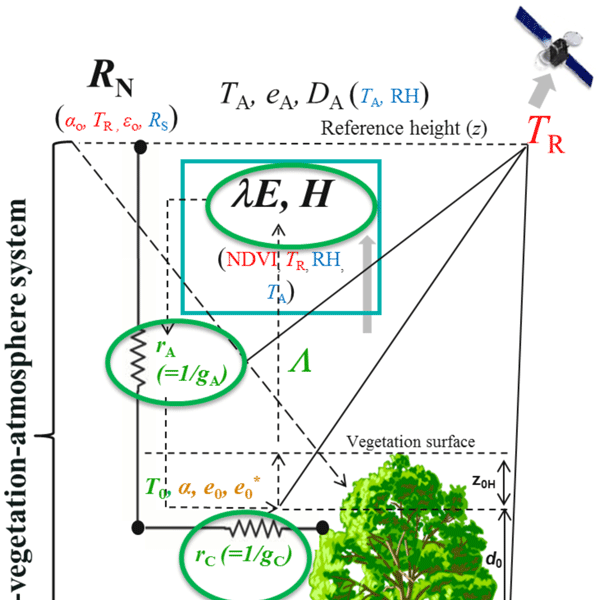 Results highlight the highly non-linear nature of climate–vegetation interactions. L-band radiometry is considered to be one of the most suitable techniques for estimating surface soil moisture (SSM) by means of remote sensing. Brightness temperatures are key in this process, as they are the main input in the retrieval algorithm which yields SSM. This paper compares brightness temperatures measured by the SMOS mission to two different sets of modelled ones. It shows that models and remote-sensed values agree well in temporal variability, but not in their spatial structures. We built observation operators by the CDF matching method. Two-year duration was identified as the optimal data length in prediction accuracy. Application in different climates in USA showed these operators are a robust statistical tool for upscaling soil moisture from surface to profile by using exponential filter as a reference method. The findings here may be applied in the prediction of profile soil moisture from surface measurements via remote sensing techniques. Soil moisture is a crucial variable for a variety of applications, ranging from weather forecasting and agricultural production to the monitoring of floods and droughts. Satellite observations are particularly important in regions where no in situ measurements are available. Our study presents a method to integrate global near-real-time satellite observations from different sensors into one harmonized, daily data set. A first validation shows good results on a global scale. In this study, we compiled a set of within-canopy and above-canopy measurements of energy and water fluxes, and used these data to parametrize and validate the new multi-layer energy budget scheme for a range of forest types. An adequate parametrization approach has been presented for the global-scale land surface model (ORCHIDEE-CAN). Furthermore, model performance of the new multi-layer parametrization was compared against the existing single-layer scheme. The WACMOS-ET project aims to advance the development of land evaporation estimates on global and regional scales. Evaluation of current evaporation data sets on the global scale showed that they manifest large dissimilarities during conditions of water stress and drought and deficiencies in the way evaporation is partitioned into several components. 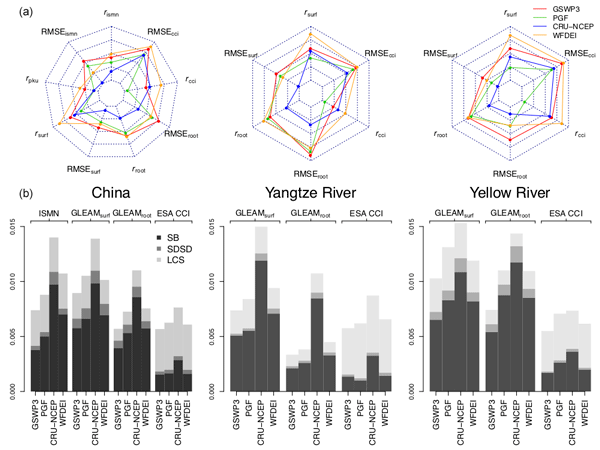 Different models perform better under different conditions, highlighting the potential for considering biome- or climate-specific model ensembles. In this study a common reference input data set from satellite and in situ data is used to run four established evapotranspiration (ET) algorithms using sub-daily and daily input on a tower scale as a testbed for a global ET product. The PT-JPL model and GLEAM provide the best performance for satellite and in situ forcing as well as for the different temporal resolutions. PM-MOD and SEBS perform less well: the PM-MOD model generally underestimates, while SEBS generally overestimates ET. We developed a new formulation of USLE, named Soil Moisture for Erosion (SM4E), that directly incorporates soil moisture information. SM4E is applied here by using modeled data and satellite observations obtained from the Advanced SCATterometer (ASCAT). SM4E is found to outperform USLE and USLE-MM models in silty–clay soil in central Italy. Through satellite data, there is the potential of applying SM4E for large-scale monitoring and quantification of the soil erosion process. This paper assesses the potential of satellite precipitation estimates (SPEs) for precipitation measurement and hydrological and snow modelling. A total of 12 SPEs is considered to provide a global overview of available SPE accuracy for users interested in such datasets. Results show that, over poorly monitored regions, SPEs represent a very efficient alternative to traditional precipitation gauges to follow precipitation in time and space and for hydrological and snow modelling. 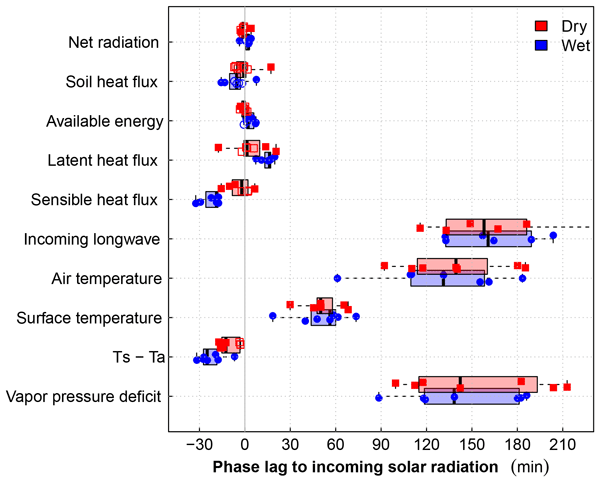 We estimate the phase lag of surface states and heat fluxes to incoming solar radiation at the sub-daily timescale. While evapotranspiration reveals a minor phase lag, the vapor pressure deficit used as input by Penman–Monteith approaches shows a large phase lag. The surface-to-air temperature gradient used by energy balance residual approaches shows a small phase shift in agreement with the sensible heat flux and thus explains the better correlation of these models at the sub-daily timescale. The potential of rain to cause soil erosion by runoff is called rain erosivity. Rain erosivity is highly variable in space and time even over distances of less than 1 km. 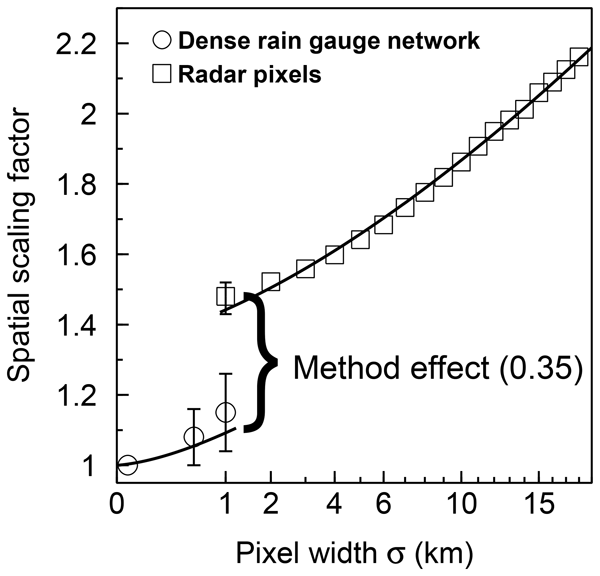 Contiguously measured radar rain data depict for the first time this spatio-temporal variation, but scaling factors are required to account for differences in spatial and temporal resolution compared to rain gauge data. These scaling factors were obtained from more than 2 million erosive events. The goal of this article is to first provide an overview of the available PERSIANN precipitation retrieval algorithms and their differences. We evaluate the products over CONUS at different spatial and temporal scales using CPC data. Daily scale is the finest temporal scale used for the evaluation over CONUS. We provide a comparison of the available products at a quasi-global scale. We highlight the strengths and limitations of the PERSIANN products. 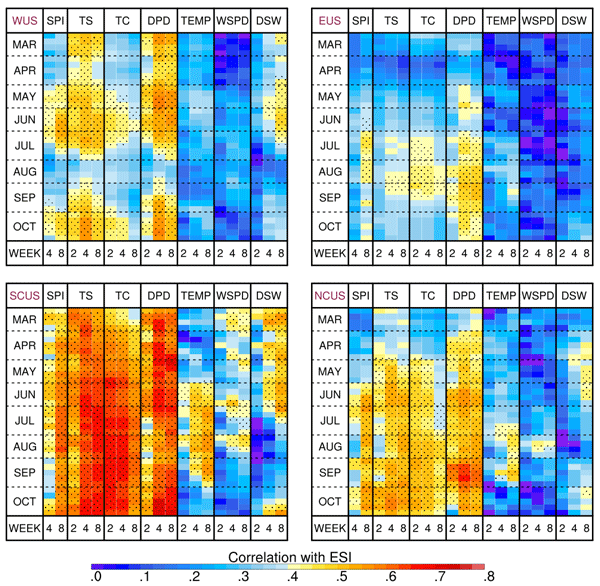 Correlation analyses were used to explore relationships between the Evaporative Stress Index (ESI) – which depicts anomalies in evapotranspiration (ET) – and various land and atmospheric variables that impact ET. The results revealed that the ESI is more strongly correlated to anomalies in soil moisture and near-surface vapor pressure deficit than to precipitation and temperature anomalies. Large regional and seasonal dependencies in the strengths of the correlations were also observed. Multiple satellite observations can be used for surface and subsurface soil moisture estimations. In this study, satellite observations along with a mathematical model were used to distribute and develop multiyear soil moisture profiles over the southeastern US. 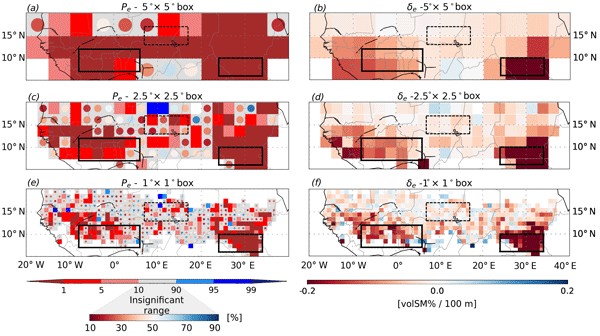 Such remotely sensed profiles become particularly useful at large spatiotemporal scales, can be a significant tool in data-scarce regions of the world, can complement various land and crop models, and can act as drought indicators etc. In Africa field-based meteorological data are scarce; therefore global data sources based on remote sensing and climate models are often used as alternatives. To assess their suitability for a large and topographically complex area in East Africa, we evaluated multiple climate data products with available ground station data at multiple timescales over 21 regions. The comprehensive evaluation resulted in identification of preferential data sources to be used for climate and hydrological studies. Existing satellite products are often insufficient for use in small-scale (< 10 km) hydrological and meteorological studies. We propose a new approach based on the cumulative distribution of frequency to downscale satellite precipitation products with geostationary (GEO) data. This paper uses CMORPH and FY2-E GEO data to examine the approach in six different climate regions. The downscaled precipitation performed better for convective systems. In North Africa rain storms can be as vital as they are devastating. The present study uses multi-year satellite data to better understand how and where soil moisture conditions affect development of rainfall in the area. Our results reveal two major regions in the southwest and southeast, where drier soils show higher potential to cause rainfall development. This knowledge is essential for the hydrological sector, and can be further used by models to improve prediction of rainfall and droughts. 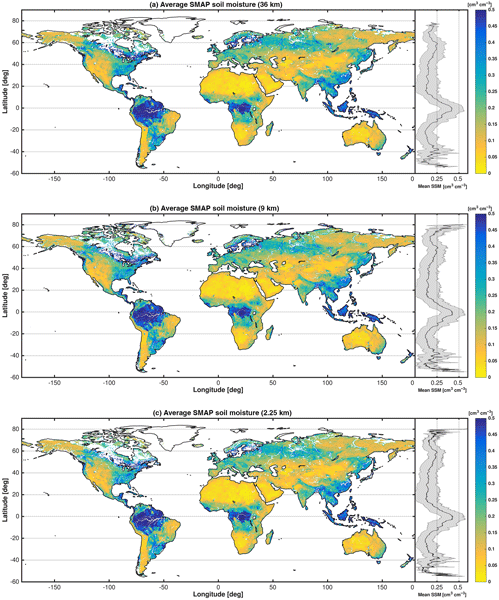 We report the first ever regional-scale implementation of the Surface Temperature Initiated Closure (STIC1.2) model for mapping evapotranspiration (ET) using MODIS land surface and gridded climate datasets to overcome the existing uncertainties in aerodynamic temperature and conductance estimation in global ET models. Validation and intercomparison with SEBS and MOD16 products across an aridity gradient in the US manifested better ET mapping potential of STIC1.2 in different climates and biomes. Knowing the characteristics of extreme precipitation is useful for flood management applications like sewer system design. The potential of a 12-year high-quality weather radar precipitation dataset is investigated by comparison with rain gauges. Despite known limitations, a good agreement is found between the radar and the rain gauges. Using the radar data allow us to reduce the uncertainty of the extreme value analysis, especially for short duration extremes related to thunderstorms. The article summarises changing patterns of the water-food-energy nexus in India during recent decades. The work first analyses satellite data of water storage with a validation using the observed well data. Northern India shows a declining trend of water storage and western-central India shows an increasing trend of the same. Major droughts result in a drop in water storage which is not recovered due to uncontrolled ground water irrigation for agricultural activities even in good monsoon years. Rainfall frequency analyses from radar and satellite estimates over the eastern Mediterranean are compared examining different climatic conditions. Correlation between radar and satellite results is high for frequent events and decreases with return period. The uncertainty related to record length is larger for drier climates. The agreement between different sensors instills confidence on their use for rainfall frequency analysis in ungauged areas of the Earth. 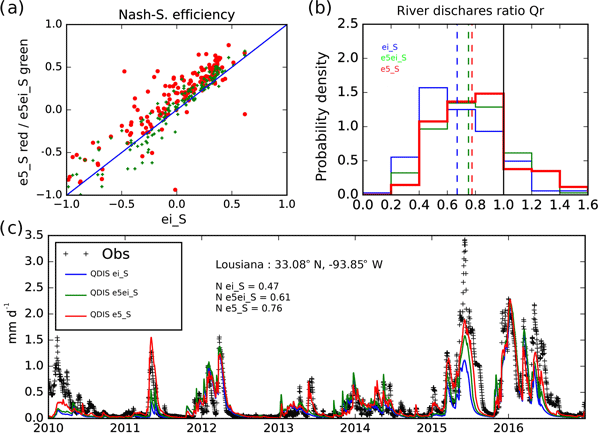 This study assesses the impact on river discharge simulations over France of assimilating ASCAT-derived surface soil moisture (SSM) and leaf area index (LAI) observations into the ISBA land surface model. Wintertime LAI has a notable impact on river discharge. SSM assimilation degrades river discharge simulations. This is caused by limitations in the simplified versions of the Kalman filter and ISBA model used in this study. Implementing an observation operator for ASCAT is needed. Drought propagation from rainfall deficits to reservoir depletion was studied based on remote sensing, monitoring and modelling data. Regional droughts were shown by widespread depletion in total water storage that reduced soil moisture storage and runoff, greatly reducing reservoir storage. The multidisciplinary approach to drought assessment shows the linkages between meteorological and hydrological droughts that are essential for managing water resources subjected to climate extremes. 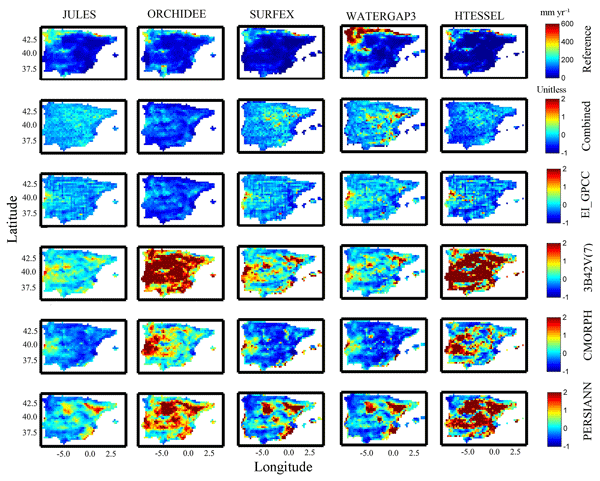 A remote sensing algorithm named temperature sharpening and flux aggregation (TSFA) was applied to HJ-1B satellite data to estimate evapotranspiration over heterogeneous surface considering landscape and statistical effects on mixed pixels. Footprint validation results showed TSFA was more accurate and less uncertain than other two upscaling methods. Additional analysis and comparison showed TSFA can capture land surface heterogeneities and integrate the effect of landscapes within mixed pixels. The Tibetan Plateau plays a major role in regional and global climate. The knowledge of latent heat flux can help to better describe the complex interactions between land and atmosphere. The purpose of this paper is to provide a detailed cross-comparison of existing latent heat flux products over the TP. The results highlight the recently developed latent heat product – High Resolution Land Surface Parameters from Space (HOLAPS). 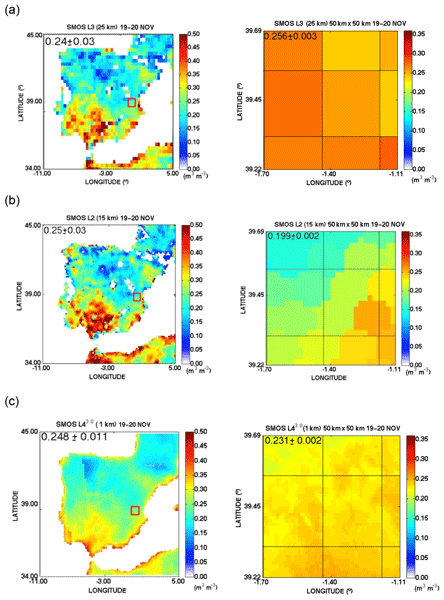 This paper gives a comprehensive evaluation of a simple newly developed downscaling scheme using in situ measurements from REMEDHUS network, a first cross-comparison of the performance of the downscaled soil moisture from MODIS and MSG SEVIRI, an evaluation of the performance of the downscaled soil moisture at different spatial resolutions, and an exploration of the influence of LST, vegetation index, terrain, clouds, and land cover heterogeneity on the performance of VTCI. 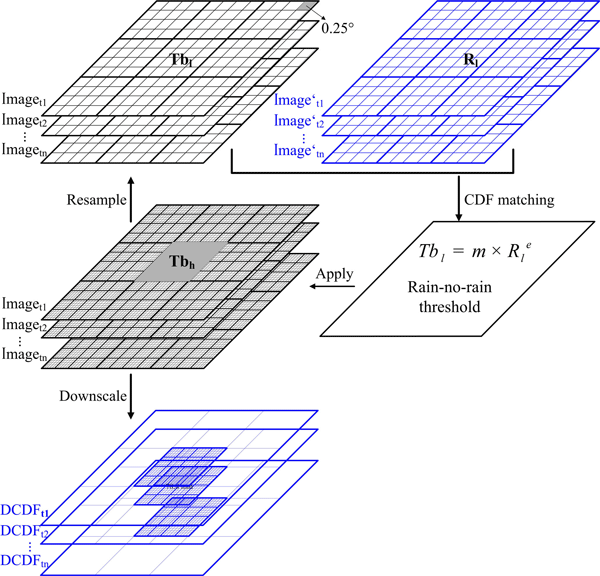 The paper presents a new model (SPARSE) to estimate total evapotranspiration as well as its components (evaporation and transpiration) from remote-sensing data in the thermal infra-red domain. The limits of computing two unknowns (evaporation and transpiration) out of one piece of information (one surface temperature) are assessed theoretically. The model performance in retrieving the components as well as the water stress is assessed for two wheat crops (one irrigated and one rainfed). A diagnostic analysis of the space-time structure of error in quantitative precipitation estimates (QPEs) from the precipitation radar on the Tropical Rainfall Measurement Mission satellite is presented here in preparation for the Integrated Precipitation and Hydrology Experiment (IPHEx) in 2014. A high-density raingauge network over the southern Appalachians allows for direct comparison between ground-based measurements and satellite-based QPE (PR 2A25 Version 7 with 5 years of data 2008-2013).